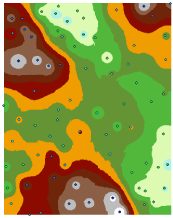 Interpolation predicts values for cells in a raster from a limited number of sample data points. It can be used to predict unknown values for any geographic point data, such as elevation, rainfall, chemical concentrations, and noise levels. The assumption that makes interpolation a viable option is that spatially distributed objects are spatially correlated; in other words, things that are close together tend to have similar characteristics. For instance, if it is raining on one side of the street, you can predict with a high level of confidence that it is raining on the other side of the street. You would be less certain if it was raining across town and less confident still about the state of the weather in the next county. Using the above analogy, it is easy to see that the values of points close to sampled points are more likely to be similar than those that are farther apart. This is the basis of interpolation. A typical use for point interpolation is to create an elevation surface from a set of sample measurements. Geostatistical Analyst also provides and extensive collection of interpolation methods. Some typical examples of applications for the interpolation tools follow. 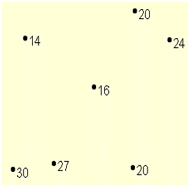 The accompanying illustrations will show the distribution and values of sample points and the raster generated from them. The input here is a point dataset of known rainfall-level values, shown by the illustration on the left. The illustration on the right shows a raster interpolated from these points. The unknown values are predicted with a mathematical formula that uses the values of nearby known points. A typical use for point interpolation is to create an elevation surface from a set of sample measurements. In the following graphic, each symbol in the point layer represents a location where the elevation has been measured. 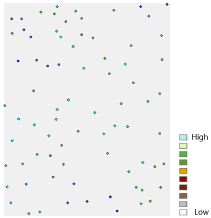 By interpolating, the values for each cell between these input points will be predicted. In the example below, the interpolation tools were used to study the correlation of the ozone concentration on lung disease in California. The image on the left shows the locations of the ozone monitoring stations. The image on the right displays the interpolated surface, providing predictions for each location in California. 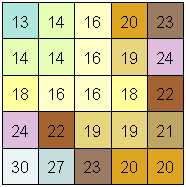 The surface was derived using kriging.